Audio Dedupe will “Listen” to songs in order to find similar and duplicate audio files. The tool can find duplicate MP3 files and 18 other popular audio formats. It will list all similar and duplicate songs grouped by similarity. 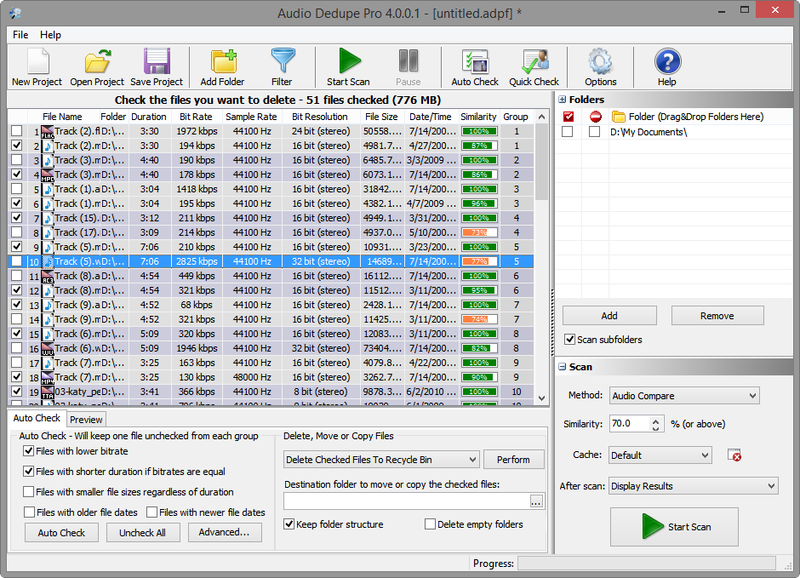 Audio Dedupe can automatically select files with lower quality for deleting. There is a built-in audio player with continuous playback that can be used in order to quickly review the quality of the duplicate songs. Having duplicate audio files on mp3 players, iTunes, iPod, iPhone or iPad is not only annoying, but wastes valuable storage. While it may be easy to clean up few hundred files most people have huge collections and identifying and cleaning duplicates turns out not to be so easy. Audio Dedupe is an innovative tool that can recognize duplicate songs even if they are stored in different file formats. This is something that a standard duplicate file finder can not achieve. This is because if the same song is stored in different audio formats the file data is completely different even if it contains the same audio. Unlike the common duplicate file finders Audio Dedupe decodes the audio data and performs real audio analysis in order to identify similar and duplicate music inside an audio collection. There is a free demo available for download at www.mindgems.com, which you can use in order to evaluate the tool. MindGems Inc. provides also a tool that can find similar images named Visual Similarity Duplicate Image Finder (VSDIF). It works in a similar to Audio Dedupe way, but for image files. You might also check the free Duplicate File Finder and Folder Size tools that will help with the disk cleanup process. Entering takes just few seconds and is not related to filling endless surveys. Just share MindGems on your favorite social networks using the widget below and sign up for the newsletter. MindGems Inc. will not reveal your e-mail address to third parties. It will be used to notify you if you are the winner in this giveaway and to notify you about product update, discounts and other giveaways that are organized by MindGems Inc. If you do not want to receive those updates you can always unsubscribe once the giveaway ends. This giveaway will be active until 22 May 2013. This entry was posted in Giveaways, Information and tagged Abee MP3 Duplicate finder - find duplicate mp3's, Audio Comparer, Audio Comparer: Duplicate MP3 Finder and MP3/WMA/OGG, Audio Dedupe, DuMP3 - duplicate & similar file finder, Duplicate Music Files Finder, EF Duplicate MP3 Finder, Find Similar Artists or Bands, Find Similar Audio Files, Find Similar Songs, Find Similar Songs with Audiobaba, Finding Similar Songs/Artists - Artists - Music, Finding songs that sound the same, Free Duplicate MP3 File Finder, Freeware - Free Duplicate mp3 finder, Giveaway, More tracks like this, Mp3 Duplicate Finder, Music finder, Music Roamer - Discover New Music, Organize Music Libraries, Remove Duplicate Songs, Visual Music Search Engine, Which Duplicate MP3 Finder Is Best? on April 22, 2013 by MindGems Support.